What do little kids know? During the TOK course my students see three movies. The Truman Show (1998) works well at the beginning of the course. It evokes Plato's Allegory of the Cave, and touches on themes encountered in the Feral children and forbidden experiments unit.Vera Drake (2004) is the case study material for the Saint or serial killer? ethics unit taught in the second TOK year. We usually see and discuss Memento (2001) as a set-piece, evening activity during a three-day, entire 11th Grade, residential Retreat. The TOK Retreat binds the class and primes students for the IB Diploma experience. I find Memento well worth revisiting in the second year when students are students are more ready to tackle existential questions of identity. Students tackle a Memento writing assignment in the Who do you think you are? unit in Memory as a Way of Knowing. 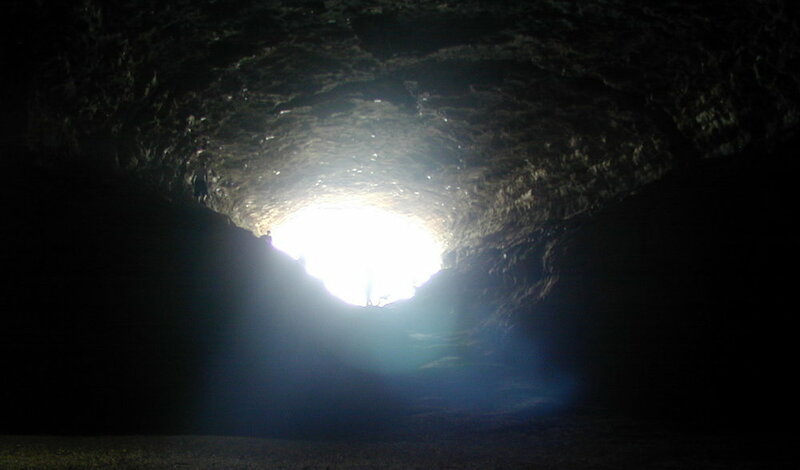 The Allegory of the Cave is a powerful metaphor for a variety of TOK knowledge issues. The following paragraph is offered to students together with a cartoon illustration to stimulate wider interpretations and deeper insights into Plato's original text. Mara Lea Brown (2005) Plato's Allegory of the Cave. Ink on paper. And do you see, I said, men passing along the wall carrying all sorts of vessels, and statues and figures of animals made of wood and stone and various materials, which appear over the wall? Some of them are talking, others silent... Like ourselves… they see only their own shadows, or the shadows of one another, which the fire throws on the opposite wall of the cave?" Watching the Truman Show (1998) in bite-sized chunks, peppered with class discussion, will span several class periods. To place the movie in context, students first participate in three readings of an extract from Chapter VII of Plato's Republic which introduces the Allegory of the Cave. The cartoon illustration and the short Knowledge Issues text (above) are provided separately. 1. Students read through the text in silence. 2. One student is appointed to play Socrates, another plays Plato's brother, Glaucon. Whilst the players perform the dialog, the remainder of the class with closed eyes try to form a mental picture of the denizens of the cave. 3. The students are handed a copy of the cartoon. Socrates and Glaucon repeat their performance. This time the students examine and try to make sense of the cartoon illustration. Without any further discussion, the students, now primed, see the first part of The Truman Show. As they view the rest of movie, and especially after the cathartic ending, the following guiding questions may or may not be needed to initiate and steer class discussion. 1. Truman is “on the air, unaware.” Is ignorance bliss? 2. What parallels do you notice between Truman’s imprisonment in the Seahaven dome and the denizens of Plato’s cave? 3. To what extent are we all being duped by product placements and false realities presented to us by commercial advertising and news media? What are the essential differences between the Truman predicament and our own? 4. “A robin redbreast in a cage, Puts all heaven in a rage.” What has William Blake’s couplet from Auguries of Innocence (1863) got to do with the Truman show? 5. What specific ethical objections arise from the “forbidden experiment” imposed on Truman since his birth in front of a live audience? 6. How is Truman eventually able to recognize his predicament? What does this say about human fallibility and capability? What emotional states are involved in the final scene? Is there a scientific method?